For example, there was a strong focus placed on project-based learning at the beginning of MLTI. I wonder sometimes if PBL didn’t really take off because, although the enthusiastic teachers implemented it, the much larger group of conventional teachers simply didn’t see themselves in PBL (“Oh, project-based learning. Tammy does that, God bless her. Her kids love it and she does a great job. But that’s not what we do…”). Those solid conventional teachers live most of the time in the Foundational Knowledge bucket. PBL lives mostly in the Putting Knowledge to Use bucket. When we simply spoke about PBL, without the larger context of a more comprehensive instructional model, there was no bridge or on-ramp for those typical teachers. Using the Plain English Instructional Framework, however, provides those bridges and on-ramps. Every time a teacher does a great job helping students learn foundational knowledge, they can point to that bucket and say, “I did that.” They receive validation for what they do. But at the same time they point to something they did, they also see buckets that they do less frequently. It creates the opportunity for them to say, “I wonder how I might help my students develop deeper learning?” And maybe eventually other buckets such as Motivating Students or Putting Knowledge to Use. Another advantage of a Plain English Instructional Model is that it is in plain English. Many conventional teachers seem to dislike or distrust jargon. Is it because of the long list of innovations that have been introduced in school but never lasted long? Is it because we all wonder why we have to use fancy words for ideas that can be explained plainly? Is it because you have to be “in the know” to understand jargon, but anyone can understand plain English? Our goal is to help improve the learning for all students in all classrooms. That means the bulk of teachers we want to help expand their teacher practice aren’t the early adopters or the folks who excitedly jump on new ideas. It is the solid, conventional teachers, who will change with good reason, if it makes their life easier in the classroom, or if they quickly see it benefiting students, but who are suspicious of change and “innovation.” This is the group we need to support and the group we must target with our efforts. The Plain English Instructional Model is one way we are trying to support these educators. This entry was posted in Focus on the Learning, Managing School Change, Professional Learning, Setting Expectations on March 9, 2017 by Mike Muir. We’ve been working hard to help Maine’s schools adopt a “More Verbs, Fewer Nouns” stance when thinking about the technology in our schools. We want schools to be sure they are focused more on what they want to do with the devices than with the devices themselves. There is no doubt that there is a lot of “noun” work that needs to happen to make the learning (the “verb” work) happen, but we want to make sure that when we talk about tools and devices that it is in service to the kinds of learning experiences we provide for students. Tech for Practice and Deepening Understanding: What tools and resources help students develop some fluency with those basics? Tech for Using Knowledge: How can we contextualize learning and make learning engaging and meaningful? How can students use their knowledge? What is the role for creating and creativity, and for project-based learning. 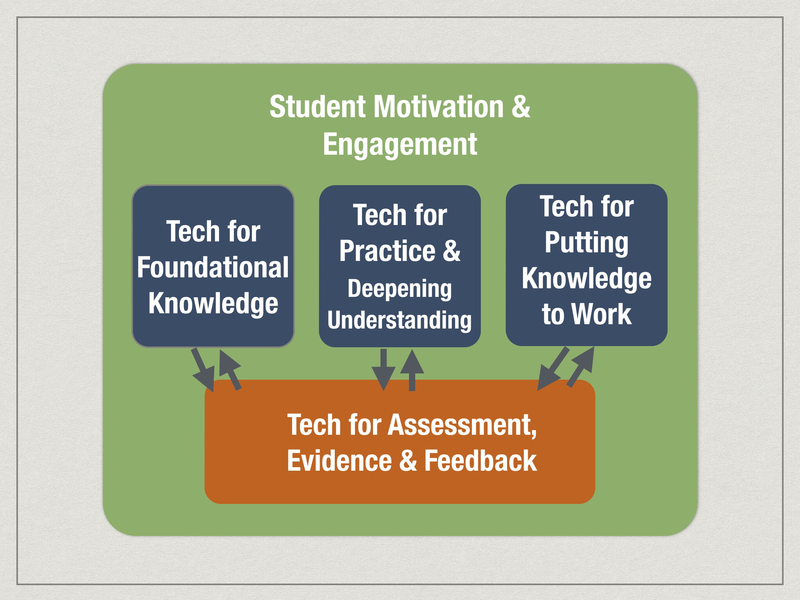 Tech for Assessment, Evidence of Learning & Feedback: How can technology help us capture what students know and can do, and provide feedback to help drive continuous improvement? Student Motivation & Engagement: How do teachers ensure that students are mentally and physically engaged? How can teachers create the conditions for student self-motivation? This instructional model is not intended to replace any general or content specific instructional model that a school has already adopted. In fact, it is quick work to do a crosswalk between those models and this one. The goal of this Plain English Instructional Model it to provide a framework around which educators and school leaders can have a conversation (a plain English conversation!) about teaching and learning and the role of technology in pedagogy and instruction. In the next post, we describe the advantages of a Plain English Instructional Model. This entry was posted in Focus on the Learning, Professional Learning, Setting Expectations, Shared Vision for Learning on March 8, 2017 by Mike Muir.